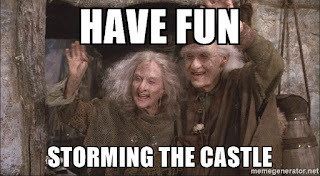 From September 24-25, WriteOnSisters.com is hosting a Princess Bride Linkup Party, in which bloggers come together to write about the amazingness that is The Princess Bride. Why? Because 29 years ago, on September 25, The Princess Bride movie hit cinemas, and the world was changed forever. My contribution to this linkup is a rundown of all my favorite quotes in The Princess Bride. So without further ado, here they are! Westley: Who are you? Are we enemies? Why am I on this wall? Where is Buttercup? Inigo Montoya: Let me explain. Inigo Montoya: No, there is too much. Let me sum up. Buttercup is marry Humperdinck in little less than half an hour. So all we have to do is get in, break up the wedding, steal the princess, make our escape... after I kill Count Rugen. Just because it's so meme-able. 3. The Impressive Clergyman's lines. ... Which I can't type because they make no sense when you spell them out phonetically. 4. "Hello. My name is Inigo Montoya. You killed my father. Prepare to die." I get chills at this part every time. It's one of the most iconic lines in The Princess Bride -- and for good reason. Plus, you can repurpose this quote for almost any wrongdoing. Example: "Hello. My name is Inigo Montoya. You ate my ice cream. Prepare to die." 5. Anything said by Miracle Max. 6. And finally, Buttercup's challenge. This isn't in the movie, but it's brilliant. "They obey me," Yellin said. "And I am in charge of enforcement, and--"
There was no doubting her sincerity. Or power. Or capability for vengeance. She stared imperiously across the Brute Squad. "Save Humperdinck," one Brute said, and with that they all dashed into the castle. "Save Humperdinck," Yellin said, the last one left, but clearly his heart wasn't in it. "Actually, that was something of a fib," Buttercup said as they began to ride for freedom, "seeing as Lotharon hasn't officially resigned, but I thought 'I am the Queen' sounded better than 'I am the Princess.'" 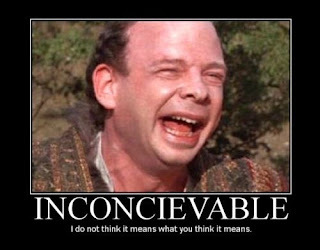 So, those are my favorite Princess Bride quotes. Did I miss any good ones? Share your faves in the comments! Great quotes! I love almost every line exchanged between Westley and Inigo during their fight. I think it's one of the best parts of the whole movie. Yes! I was thinking about including those, but there were too many to choose from. Ooh, yes, those are good! I haven't read the book, so I didn't know about that last quote. That's a great one!